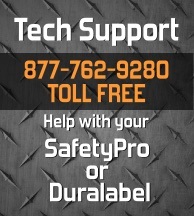 Many SafetyPro users, and new SafetyPro customers, have questions about labeling their ammonia pipe systems. We offer equipment and supplies that make ammonia pipe labeling easy. Our free guide to ammonia pipe labeling will help you identify and correctly use each portion of the standard ammonia pipe label. OSHA standards call for the proper labeling and identification of ammonia, regardless of how it is stored or transported. Ammonia labels should be easily visible and standardized for maximum visual communication. Labels should be chemical and environmentally resistant to wear and damage. SafetyPro labels meet all of these specifications. The links listed below will provide you with more resources for your ammonia pipe labeling project. Read up on OSHA ammonia pipe labeling standards, and be sure to click the link to get our free ammonia pipe labeling guide!